As usual, I loaded the bikes in the rain. We agreed that I’d bring up the sidecar in a trailer graciously loaned to us by the McDermotts and my F1 – fully lock-wired and adorned with Adam’s #28 stuffed into my van with all the usual junk. The rainstorm and a few last minute work details meant a late departure to Mosport and by the time I rolled through the gates it was banging on the door of 9PM – too late to fully unload and set up my bed in the van. So I found the pit we were sharing with Adam’s Suzuki sponsor, Kevin, Dave Hughes and ex-factory guy Hurley Wilvert, dropped the trailer and cruised around the pits - visiting for a half hour before heading off in search of a hotel for the night. Good thing I did, ‘cause when I got back to the track early Friday morning, it looked like a tornado had been through the facility and by all accounts that was the case. My super heavy duty spare EZ-UP borrowed by Rob for the weekend was twisted almost as badly as most of the cheaper ones by a wind so strong that Bruce Meyers – hanging by one of the cross beams during the height of the storm – was lifted right off the ground. Our pit wasn’t to badly wasted, and with about an hours’ work, we had the space set-up and the Honda 125, F1 and the rig prepped for the weekend. Weird being there and not racing, and as I set about organizing tools & stuff I realized that the only other time I’d been here for the VRRA festival and not ridden was the first time I attended about 11 years ago. On the upside, not participating meant that I could chain-smoke, guzzle coffee and work on my tan. On one hand, I wasn’t surprised that Adam was going for as much track time and adventure as he could, but on the other, I really worried about his ability to find the energy to run two heat races, and four main events – two of which were on a sidecar rig that had never been raced in its current form. He had the 125 entered in Period 4 F3 and my F1 in the Period 4 wave of the Masters Race and the rig in Period 2 and a last minute sidecar Masters race. With practice in 3 of the four possible classes, it was bound to be non-stop action all weekend. As we were registering Adam for the Masters races Friday morning, we almost entered the F1 in the Endurance race when we realized that Dan Gosen was available and that he and Adam would likely run away with the race. My good sense prevailed. And I was able to focus on my job - keeping all three machines ready, fueled and prepped for action. In the case of the two proven solo bikes, a fairly easy task, but the rig was another story entirely. It still ran like crap and although one might think that with all the resources around that could be tapped for advice and a free day of practice, the hot set-up was only a short distance away… Hey, I know better. So, the first order of business was to find the other teams running XS 650 engines and find out what their carburetion baseline might be (and where all their spare jests were hidden). We found a ready supply of advice and jets and with the consensus being that we weren’t far off with the 175’s, I slapped in some 180s and sent Adam and his son Hugh down to the freshly paved and mercifully empty lower pit to give it a shot. And it ran like crap - way too rich. So we went down two sizes from our starting point, and then down two more sizes and then down until we couldn’t find anyone who had something smaller than a 130 – or for that matter anyone who had ever heard of running a jet that small in an XS 650. By this time we were fooling around with the fuel pump regulator as well and finding that we were sort of getting close to the ball park. So, out they went into the first open practice and damned if the thing didn’t handle and seemed to be more or less in the game as far as power. By late afternoon, Adam had been out on the F1, the Honda and the slowly improving rig a few times and seemed to be no worse for wear – although we kept him well hydrated and in the shade while I continued to chain smoke and swap jets. They went out at the head of the sidecar pack in the last session of the day and – watching from turn 2, I was astounded by how competitive he and Hugh were and (with a newfound fuel pump setting) how close to the rest of the field the rig was. In fact, they were only passed by one rig – that of the dominant Paul & Marie Whittaker team. We were in business. Adam’s entire family showed up for the event: son Jake with wife and baby, daughter Carly, Adam’s Ti and her daughters – and while it frequently made my job a little more challenging, the warm vibe kept the edge off things. Saturday practice, Adam was his usual smokin’ fast on the solo bikes and as he and Hugh got faster on the rig – of course, stuff began to break. But they were having a blast, Hugh was making sure everyone could see the massive bruise on his shoulder from whacking a curb and getting fully involved in the repairs to the rig. Adam looked relaxed and fit – but wired. My day was an endless stream of fueling, jet changes, tire pressures and ad-hoc repairs to the rig punctuated by quick trips up to Turn 2 to watch him in the heat races and practice sessions. The day tore past in what seemed like just a few hours and after a quick trip into town with Rob to catch a bite, I went off in search for Fran so we could take a long overdue walk out to Turn 8. Fran was in high spirits – having won the Endurance race with his latest team mate Robbie Nigl on the old TT1 Ducati. Robbie arrived for the weekend with his TT and turned out to be a seriously fast guy – turning 1:36s on the TT1 during the race. We were into sunset when we got out to the scene of my crash in May ’06 and to set the stage, Fran stood in the spot that he would have been at on track when everything went wrong and I became very, very confused. So, I asked him where I was and he pointed to a spot just a few inches from the inside curb at the entrance to 8 – only a few feet away from where he was standing and I continued to stammer a few meaningless words while my brain tried to process the facts. When I asked why he had executed such an uncharacteristically early turn in on the inside line he replied “because you were supposed to be there..” and pointed to a space a bit to the outside of where would normally turn in. And then the events immediately preceding Turn 8 came back to me in a rush..
As were came barreling up to the end of the back straight, I came up on the outside of Fran (I’ve got plenty more power don’t’cha know..) just to say “hi” and as we crested the last hill and prepared to set-up for 8, I backed off enough to slip behind him and sneak up on his inside – planning to slip under him for a pass if his entry was conservative. It was, and I lined up for an inside pass, but he thought I was still on the outside and going to make a move there, so he took the early turn-in with a hard inside line to give me room for an outside pass – and effectively slammed the door on my face. All this data washed over me in an instant and I stepped back so I could snap my head to the right and follow the imaginary trajectory that I took at some 120MPH after clipping the inside curb. It was a miracle that we didn’t tangle in the instant that I lost control and whipped across the track with the back wheel apparently swapping directions. “My fault entirely” I said quietly and then asked Fran where I actually hit. My trajectory ran me off track on a 45 degree angle - missing the gravel trap by a few yards and running me head on into the six-deep and four-high stack of tires in front of the concrete wall. By sheer luck I hit the sole straw bale that began the increasingly deep line of bales that would protect a rider from a crash on the exit of the corner. According to Fran, the bale exploded – stopping the F1. And I sailed up and over. I knew at once why Fran had been somewhat reluctant to talk of the incident – there was always the off chance that I wouldn’t connect the dots and accept the blame. Remarkably, all this knowledge gave me a great sense of closure. I hadn’t blacked out and I knew why the crash happened. All the irrational fear vanished in the 5 minutes it took to reconstruct the crash. By Sunday, I’d settled into my routine – using Adam’s super-slick jetting computer and logbook to set up the RS125 jetting and slapping the correct amount of duct tape on the radiator between sessions. The F1 was easy; tire pressure and fuel, but the rig was another story. He and Hugh continued to get faster – running up at a podium pace that continued to break stuff that just couldn’t handle the vibration or Gs. I was able to zip up to Turn 2 to watch Adam’s practice sessions and races on the rig and the F1, but I was usually hip-deep into the rig when he was out on the RS125. What amazed me was Adam’s energy and attitude and the transformation usually occurred during the first session of each day. When he showed up in the morning, it was obvious to me that I was looking at a man battling three types of cancer but when he got off the bike after the first round, he was a different man. And he simply flew. He cleaned-up on the Honda RS 125 with a typical battle that concluded with a last lap move to nail 1st. On the rig, he and Hugh took a hard fought 4th in their first event as rookies with fresh and far from sorted rig. Look at the pics and see Hugh with his upper body skimming the pavement – hands folded on his chest. Showing off. They also grabbed a 2nd in the Masters Class sidecar event despite the fact that one of the exhaust header pipes had broken right at the head – robbing the bike of some desperately needed horsepower. The high point of course for me was watching Adam on the F1 in the P4 Masters Class from Turn 3. From my vantage point I could see the machines come down through Turn 2 at triple digit speeds, run through the Turn 3 right-hander and disappear over the crest of Turn 4 at full throttle. I’d never seen my bike race raced and only watched it ridden by someone else a few times. But it really wasn’t about the visual – I was astounded by the incredible sound that bike has with the big motor and the open mega. Pure music – a big, flat deep bellow under power but sharp, deep and hard sounding on the overrun. Lap one was brilliant. 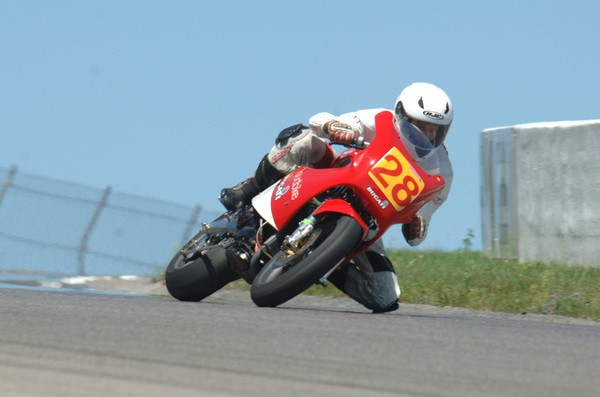 Adam came down though Turn 2 with a nice lead on the field – being chased by P4 F1 series leader Don Gosen on his highly developed, Tim Speigleburg tuned 900SS and a rider on a GSSXR superbike but lost the lead to Don in a nice drafting move and hail-Mary pass in Turn 8. The GSX rider put a hard pass on the outside of Adam about halfway though the race and slammed the door hard enough that I though they connected. I was like “Hey! That’s my bike you SOB!”. While Dan stretched out his lead, Adam shadowed the GSXR until the final lap and put a hard pass on him in Turn 8 to take 2nd. As I watched Adam all weekend, I was deeply touched by the strong possibility that this may have been his last race weekend and simply amazed that he could do what he did with such enthusiasm, optimism, humility, grace and control. The effects of the cancer aside, this is a guy who by the time the event had begun, had been on chemotherapy treatments for just under a year – not to cure the cancer, but simply to keep it at bay.